Approximate locations of six robberies listed in a CPD community alert. A group of robbery offenders has struck repeatedly on a two-block stretch of Burling Street in Lincoln Park over the past month, police said. The same crew is suspected of robbing at least three other people on nearby side streets during the same time period. According to a community alert issued by Chicago police, the robbers are all males in their mid-to-late teens who strike during afternoon and evening hours. The offenders approach their victims on the street and either grab the victim’s cell phone or take it by force. Police typically issue community alerts when they believe a series of crimes are the work of a single person or group. 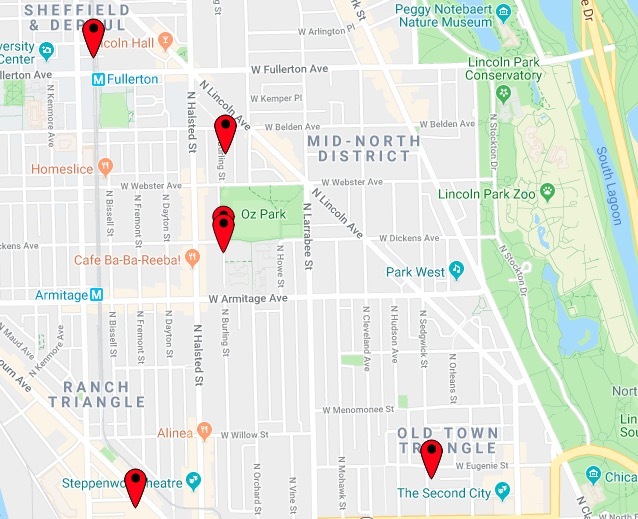 Three of the robberies have been reported on North Burling Street near Oz Park and Lincoln Park High School on Nov. 17th in the 2200 block of North Burling Street, and on Dec. 7th and Dec. 11th in the 2000 block of North Burling Street. Other incidents were reported in the 1600 block of North Clybourn on Nov. 27th; the 300 block of West Concord on Dec. 10th; and the 900 block of West Fullerton on Dec. 12th, police said. A woman was robbed late Saturday night in the 2600 block of North Burling by four men who jumped out of a passing car. The men approached the woman around 11:30 p.m. and took her purse by force. They then returned to the vehicle and were last seen heading southbound. The robbers were four black men in black and gray jackets who occupied a small, dark gray four-door car. No one is in custody.